Almo Nature Classic 140g Fish Adult Cat food is a healthy food for your cat that is made from pure ingredients. Almo Nature Classic 140g Fish Cat food is formulated specially for adult cats. This pure and simple meal is a true classic designed to suit your cat's taste perfectly. 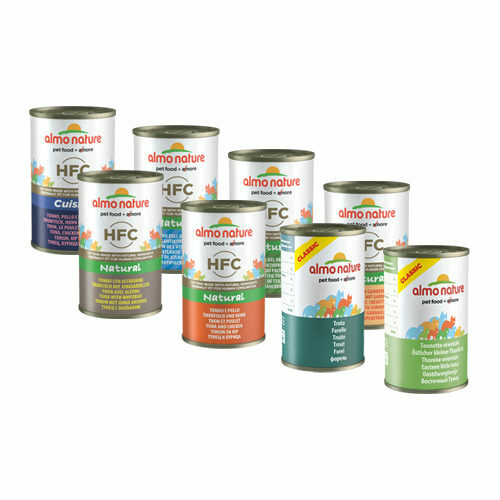 This canned food is prepared with only natural ingredients and comprises no less than 75% fish and/or meat. You can rest assured that the fish is freshly caught from the sea (not farmed) and that the meat added to this meal is sourced from producers who raise livestock entirely naturally (free of hormones and antibiotics during breeding). The fish and meat that goes into this product are cooked and processed without the use of chemicals and then preserved in their own cooking juices so that the natural levels of nutrition and flavour are maintained. This means that the fish and meat stays rich in natural vitamins and minerals, with no extra additives. There is a small amount of rice added to this meal, to make it even more complete. Almo Nature does not add any chemical preservatives and colourings to make the food appear more attractive. Classic Fish is available in 8 flavours per 24 cans of 140 grams. Have you used Almo Nature - Cat - Classic Fish before? Let us know what you think about this product.